Ok, so hopefully you saw the first few hurricane pints we opened, but in case the power went out (which it did, but only for a moment), I wanted to crack open the holiday Graeter's before I missed my opportunity to try them. 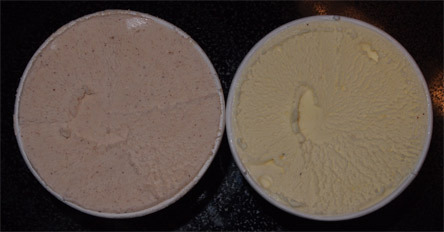 So, may I happily introduce the following two pints generously sent over by Graeter's. Behold, the rare sounding Cinnamon ice cream and the rare looking Egg Nog ice cream. I say rare looking because the pint doesn't even have an official design, it's just a generic pint with a sticker up top (no complaints since in this case it just makes it seem that more special). Now I expect to love the cinnamon and not love the egg nog, but let's dig in. I'm guessing you can tell which is which. The cinnamon has a nice beige color with wall to wall specks of cinnamon. The egg nog is a light yellow with no discernible seasoning. Actually let's zoom in better for a closer look. Technically the eggnog has a little bit of seasoning, but the cinnamon real comes to life here. What's nice here is that the french pot process has really brought a creamy version of cinnamon to the table. Sure, maybe there is a little cinnamon grit, but that's nothing compared to drying grit of the batch version I tried a few months ago. Cinnamon is a pretty unique trick, but if you forget that this is ice cream first, you won't get repeat customers (but like I said, this is not an issue for Graeter's). I think what really impresses me about the egg nog is that it is such a light and delicate flavor (well, for an egg nog). When I think of real egg nog or even Edy's version, I think of a flavor that's coated with fillers and feels very heavy on the tastebuds. Somehow Graeter's excellent french pot process has gently delivered that flavor to this wonderful base ice cream --- can you tell I'm impressed? Let me put it another way. My daughter ate her egg nog sample while disavowing the cinnamon. I don't think she loved it, but the fact it finished it is pretty positive in my book. Yet again, it's these non-chip Graeter's flavors that really showcase the wonders of the small french pot process. It's just such an excellent base product and I really can't imagine anyone not likely it. If you think H-D is a little too dense, or you think B&J is too complicated, then please go out and try one of the non-chip Graeter's flavors. They really are wonderful. On Second Scoops: Let me just say that the Cinnamon Graeter's makes a lovely edition to your early morning breakfast and the egg nog gets a thumbs up from my wife. 2017 Update: Graeter's Cinnamon Ice Cream is still delicious. 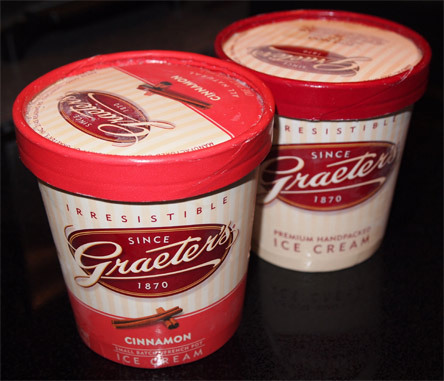 There is just a tinge of cinnamon heat to this one but it's also very sweet and an absolute delight when paired with the classic Graeter's texture. It just really comes alive like some kind of chilly cinnamon bun frosting. Thumbs up. I loved their Cinnamon even more so than their Pumpkin. Another great flavor from Graeter's!